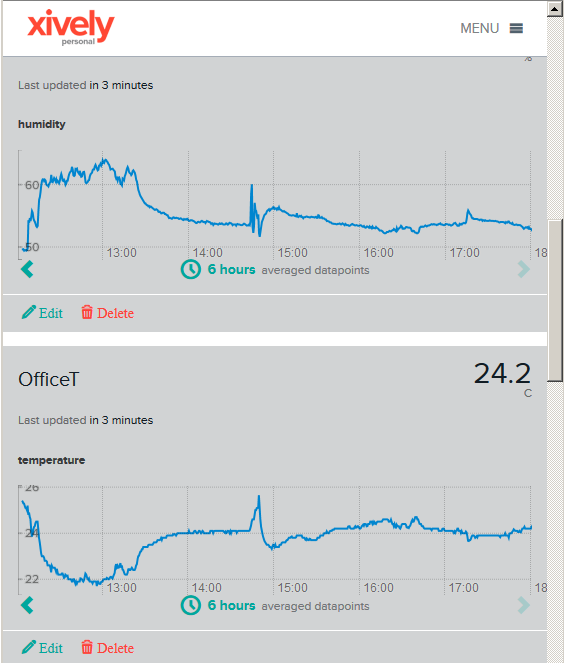 My second proof of concept application for the Mikrobus.Net Quail and EthClick uploads temperature and humidity data to Xively every 30 seconds for display and analysis. The Xively REST API uses an HTTP PUT which initially didn’t work because the payload was not getting attached. I patched the AssembleRequest method in the EtherClick driver to fix this issue. This proof of concept code appears to be reliable and has run for days at a time. The IP stack looks like it needs a bit more work. The thread ‘<No Name>’ (0x2) has exited with code 0 (0x0). The code for doing the conversions looked pretty complex so I modified a Netduino BME280 driver (uses a different approach for conversions) I have used on another projects to work on the Quail/Mikrobus architecture. Back in June I purchased a MikroBus.Net Quail board and a selection of Mikro Elektronika click boards. After figuring out I had purchased a couple of click boards which didn’t have NetMF driver support, I placed another order (ensuring drivers available) which arrived just before Christmas. The mikroBUS connector standard has quite a different approach to my arduino style boards where the analog, digital, I2C , SPI and other functionality of the microcontroller are exposed on headers. The mikroBUS standard specifies several different mechanical configurations (small, medium & large) for clicks and the connections available on the 16 pins (2 x 8 pin female headers). The mikroBus click boards only have one analog port so the x & y axis values of the joystick are read by an MCP3204 Analog to Digital convertor connected to the SPI Bus and the joystick button is connected to the interrupt port.